The Experts Have Reached a Consensus and it's Not Good! Economists from Goldman Sachs suggest that the U.S. and global economies are heading for "The Great Stagnation." It's about time. I have been warning you all for going on 2 years now. But in my opinion, it will be much worse than that. Most of Europe and the USA are bankrupt and are only being kept alive by fraudulent accounting and manipulation of the financial markets. Making it worse are the politicians who are not only completely incompetent, but cannot see further than their noses and certainly not further than the next election; always putting their own personal wallets ahead of their country's welfare. What that means in plain English is that the next decade is more likely to be similar to the "1930s" than to anything we have seen in our lifetime. That's why you need to be ultra careful to avoid the crippling effects of a devaluation of our currency and a combination of inflation and deflation, which infers massive volatility in the world's bond and stock markets. Just look at what has been happening in the last few months. Everyone involved with the European debacle including brokers, bankers, economists and financial commentators on both sides of the POND seem to all be in agreement that what is needed in Europe is an American style "TARP". How dumb and ill informed can they be? Europe's main problem is NOT a liquidity crisis, it is a spending crisis brought about by out of control Socialist policies. A onetime injection of funds, no matter how large, will not solve Europe's or America's problems. Massive cuts in government spending will just hasten the onset of Recession come Depression. It is just a matter of time before the markets and the bond vigilantes figure it all out and then, watch out below. Just because everyone is living in a fool's paradise doesn't alter the fact that Europe and America are on the verge of bankruptcy; unless our steady march into Socialism is reversed quickly. Recently, even the ultra-conservative major credit rating agencies have started warning America that all is NOT well and a ratings reduction will be coming shortly, unless some meaningful changes are made in a hurry and not in 10 years. When does a bull market end and a DEPRESSION begin and what comes first? It's an important question and not just a philosophical one. It ends when the unit of measure (the US Dollar) loses its value and its ability to store wealth and eventually becoming no longer acceptable to all as a means of payment. Many asset classes, especially the US Treasury Bonds are in an historic Bull Market Bubble and yet still have very little relative buying. How can we be in a Bubble vwith massive buying? Many governments' debts (bonds and currencies) are currently running out of buyers. Lots of people want to sell sovereign debt (i.e. Italy, Greece, Spain, Portugal and especially the United States) but cannot do so without their Central Banks buying up most of their New Issues as well as their FEDs being forced into buying in the open market to support their bond prices. These countries need to sell this debt because it's the only way they can pay for their deficit spending. This ball game cannot last forever and will soon be coming to a very sorry end. We know that some of the biggest bond funds in the world have eased off buying western sovereign debt. Even our own Bill Gross, manager of the world's largest bond fund, recently dumped all of his U.S. Treasury Bond holdings. He bought some Treasury Notes a month or so later, but I am sure that was under a tremendous amount of political pressure. But the main point is that these sovereign debt issuances are running short of buyers. We saw that lack of demand recently when the German Danske Bank called their most recent bond auction "the worst on record" and could only sell less than one third of the issue and became the 1st major bond auction failure. Who's buying? We know the buyers can't be insurance companies, pension funds or mutual funds. They can't buy anything offering such small returns and still stay in business. What's more, now that interest rates are down to around 0%, there can be no more capital gains to make up for the lack of any interest payments. There are no mom and pop savers any more. It is only the other debt-ridden western governments that are buying, just shuffling paper. They're all buying each other's junk because no one else will. They don't dare let an auction fail because that would be an admission that the world's financial system is broken. So, look for that trend to play out now that the cat is out of the bag. Eventually, all of the liabilities will be piled up nice and neat onto the backs of the Dollar and the Euro. That's the bet that the world's central bankers are making: It's a bet that I will be fading. Start buying "TBT" the dbl short Treasury ETF. On one side is the Keynesian dream, which is that you can manage an economy by socializing everything. They are not the first to believe that "one can have their cake and eat it too". That brings me to the asset class that's in a bull market and still has relatively few buyers, but not for much longer. When the major currencies begin to collapse, fail and otherwise lose credibility, the buyers for gold, silver and other "real" assets will come out of the wood work in droves. They'll have no choice. Holding government debt is a suicidal position that they will do anything to avoid once they realize the truth that at zero interest rates there can be no more capital gains, only losses, realized or not. Apple just announced that it will begin accepting payment in Chinese Yuan for iTunes music and application downloads! If that's not a sign of the growing importance of China's currency, I don't know what is. The Chinese Yuan now represents the fastest growing currency market in the world. It is the one other currency besides the Dollar now being used to pay for goods and services in Hong Kong, Russia, Brazil, Canada, Malaysia, Thailand, Indonesia and the rest of South East Asia with more countries to follow. The beginning of the END for the US Dollar has started as more and more countries are recognizing that China's currency is soon going to become as international a currency just like the Dollar: That Is why, in my opinion, we're headed toward another Dollar devaluation whether we like it or not. And now the Chicago Mercantile Exchange (CME), the world's largest trading exchange, just announced that it will begin accepting margin deposits in Yuan! These are the first signs of the rapid deterioration of the Dollar; you're bound to see and hear a lot more about China's currency in the weeks ahead. You see, China's currency is becoming more and more of an international player in its own right, simply because of the strength of China's economy. Meanwhile here in the United States, nearly every economist, central banker and politician you can name, lead by President Obama, is virtually working overtime to make China's currency even stronger! That is the only way they can think of, short of a TRADE WAR, to increase our exports while decreasing our imports. BUT China will not just sit back and allow the USA to steal their reserves. Why? Because the simple truth of the matter is that our leaders in Washington want the value of China's currency to go UP - and the value of the U.S. Dollar to go DOWN - because that's how our leaders think they can pay off the mountain of debts they've created: By depreciating the value of the Dollar. Unfortunately it's not just China that loses. The biggest losers will be the largest holders of US Dollars; the American People. Like the Euro, the U.S. Dollar is fraught with problems: $15.5 trillion worth of problems to be exact and increasing at a rate of $2 trillion plus per year. Meanwhile, China is one of the only countries in the world that has virtually no foreign debt and a piggy-bank brimming with more than $3.2 trillion in rainy day Dollars. And the Chinese are not just sitting back and taking it. They are massively increasing the amount of gold and silver that they are buying with their steadily depreciating US Dollar holdings and adding the gold and silver to their reserves. To make matters worse, with Obama's help, Canada is preparing to divert the proposed pipeline from the Alberta Tar Sands down to Houston to the west instead and sell all that oil to China. What do you think about that idea? If you can't beat them, then join them by increasing your gold holdings while decreasing the amount of US Dollars you hold as your reserves (cash, bank savings, CDs, money market holdings and Dollar denominated Bonds.) Gold coins make excellent substitutes. And the truth be told, that's exactly what Washington wants, a weaker Dollar. Of course, the powers that be will never admit to it. They keep talking that they have a strong Dollar policy. But as I've been telling you all along, Washington Never tells us the truth. The big money is tiptoeing back into silver. Last month, commodity trading advisors, pool operators, and hedge funds - the "big money" - weren't interested in silver at all.. Their short term objective was to help JPM and the rest of their gang of thieves drive the price of both silver and gold DOWN so that they can cover some of their shorts and accumulate more cheap silver, while the regulatory bodies turn a blind eye to their manipulation: But sooner rather than later, as they move back into the market, silver prices will soar. Jason Goepfert created Sentiment Trader, a service that tracks investor sentiment toward various asset classes. According to Jason, silver just bounced off its most pessimistic reading in four years. The so-called "commitment of non-commercial traders" hit 10,352. That's incredibly low. The last time sentiment numbers were that low was in August 2007. Six months later, the price of silver was 59% higher. It rose from $12 per ounce to $19 per ounce. 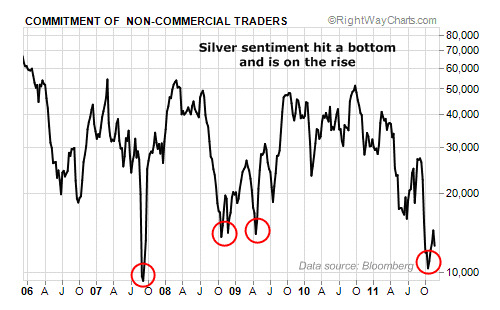 I went all the way back to 2002 and found that silver sentiment bottomed near 10,000 six times. On average, the price of silver rose 33% in the next six months and 54% over the next year. The best return came after Bottom No. 2, which coincided with the U.S. banking/credit crisis. Silver soared an eye-popping 405%, including its parabolic rise in 2010. As those numbers indicate, silver is one of the most volatile assets in the world. Over the last year, silver has seen massive price swings, including an 81% rally and two 30% drops brought on by 2 successive margin increases: That forced many traders to liquidate their silver holdings in order to meet emergency short-term requirements. (Plus, the debacle at commodity broker MF Global has scared many folks out of the market.) Would you leave your funds at the COMEX? Here comes China and their new PAGE exchange. Have any of you noticed that even Cramer is now recommending that gold and silver be part of everyone's portfolio? But the long-term drivers of gold and silver's up trends are still in place. Enormous and growing Asian economies like China and India are getting richer and they have deep cultural affinities for precious metals. Plus, the Western world has lived way beyond its means for a long time… the debts and liabilities it has taken on can only be paid back with devalued, debased money. This is bullish for "real money" assets like gold and silver. More and more people have begun to realize that it is NOT a good idea to keep their excess reserves in not so safe banks that pay little if any interest, and there is no penalty to holding your personal excess reserves in the form of gold and silver bullion since you are not giving up any interest to speak of. With sentiment so negative toward silver, it's a great time to take a position in this long-term bull market. It's about time we caught JPM and that gang of thieves with their pants down. · The Federal Reserve Bank of San Francisco quietly issued a report this September predicting that this one event could cause the stock market to crash by 50% and stay at those levels for up to 20 years. · The National Bureau of Economic Research predicted a total "Asset Meltdown" in America when it happens. · Other economists predicted it could cause an economic collapse with a "total decrease in GDP as high as 25%." · After 10 years, it's nice that they are finally catching up to me. I'm not in the business of selling fear. Seems to me almost everywhere you turn these days, someone new is trying to scare you. So, you don't need me to tell you we're about to enter into the worst Recession since the Great Depression. I have warned you well in advance so that you had time to plan. And you don't need me to tell you that America is broke and is drowning under too much debt or that we recently lost our AAA credit rating. You also don't need me to remind you that Social Security is busted, or that medical costs are rising at unsustainable rates and Obama Care, which begins in 2013, will make it all a lot worse. The last thing you need is someone else predicting the end of America. What you do need to know is the reason why all of this is really happening and what you can do to protect yourself. For the new readers just joining us, welcome. Almost six years ago, I was convinced by my loyal readers of my submissions to Gold-Eagle.com to come out of retirement and start a subscription letter; I was too young (70) to waste my time playing golf all day. I had not realized how many people were looking for somebody who would tell them the truth all the time. Since my friends in politics refused to listen, I wrote everyone who had written me to start UNCOMMON COMMON SENSE, that if I received enough subscribers over the next 2 months, I would start my letter. I received over 150 checks for $300 each and UNCOMMON COMMON SENSE was born on December 15th 2007 beginning with "REAL ESTATE CRASH 2008, RECESSION 2009". Basically, each report warned of the same thing: Beginning in 2008, America would be hit by the financial equivalent of an asteroid. Due to the gravity of this problem and the fact that nobody seems to want to talk about it honestly, each Report begins with an analysis of what is happening in Washington. My 8 page reports are an attempt to take you behind-the-scenes of a problem that no one in America wants to admit exists, especially the American people and their political leaders. This way, you can understand what's really happening and take the necessary steps to protect yourself and your family before it's too late. Because sooner or later, this is going to come out and when it does, it's going to "come out" in a big way. How is that possible? Surely the biggest up moves should happen in bull markets, not bear markets right? Always remember that the market continually tries to fool as many people as it can. In bear markets, everyone is looking to buy the bottom, whereas in bull markets, everyone is looking to sell the top. It's all a matter of HUMAN NATURE. Bull and bear markets can't happen without this phenomenon coming into play. I bring this up because, even with all of the sound and fury of the last few weeks, the S&P 500 is still only down 24 points for the year! So far, the long term trend indicators that I use continue to suggest this is a bear market rally. In spite of recent bullishness, the overriding trend is in fact down and not up. I must admit that even for me this is hard to hold on to, given the plethora of good news we have seen hit the tape. We've seen US corporate earnings hold up very well, unemployment is down and manufacturing is improving. European debt yields have shrunk recently, especially the all important 10 Year Italian yield, which has dropped from near 7.50% to 5.85% in a week! The European bond market appears to be signaling that the Euro Zone may in fact survive. Surely that has bullish implications for equities? Maybe, but I think the next big question looming in investors' minds will be the impact of all those austerity measures in Europe. Surely we have to see an economic slowdown over there. Could that cause an accelerating slowdown in China or, heaven forbid, an increasing slowdown here in the good old USA? The bottom line is that there is still a great amount of uncertainty and we are right up against the upper trading levels of the S&P 500. When faced with this type of dilemma, I will typically take a step back and rely on my long-term trend indicators. As I wrote earlier, those indicators are still bearish and as such, I must maintain a bearish stance. From a risk reward standpoint, that is actually easier to do up here against resistance. If I am wrong, I won't be wrong for big money, since everything is so close to resistance levels (and as such my stop loss points are relatively tight). If we do get a breakout here, I'll be stopped out on my shorts. I will then wait for confirmation from my trend indicators and if they confirm a bull market, I'll simply wait for the inevitable first wave sell-off after the primary move and get long. Will I get the very best prices that way? No, I will not. But what I will do is insulate myself from massive losses if this market decides to do a sudden about face because if that happens, you may not have the opportunity to get out. Long story short: Wait for the confirmation before going back bullish. Better an ounce of prevention than a pound of cure. Gold bugs over the last two weeks have become even more discouraged than they were at the end of November. As a result, contrarians detect a very strong wall of worry forming in the gold market, which could very well be the springboard for bullion rallying into new all-time high territory. I never thought that gold holders would throw in the towel and dump their gold holdings, but low and behold they finally did, presenting us with the BEST BUYING opportunity since 1973. I have been reminding you for 10 years to beware of the Golden Bull, it will do everything to scare you off. So take a deep breath and hold on tight. Gold futures have fallen 5% this month (as of December 13th) tracking a stock sell-off and losing a lot of their safe-haven allure. Two weeks ago, the contrarian analysis of gold sentiment average stood at 13.7%. Today it stands at 0.3%, which means that the average gold trader (including many gold bugs) is essentially out of the market. Two weeks ago, on the basis of the HGNSI (Hulbert Financial Digest as measured by the Hulbert Gold Newsletter Sentiment Index or HGNSI) being as low as 13.7%, contrarian analysis was already bullish on gold's prospects and yet GOLD has fallen by more than $150 per ounce. What assurances do we have that my contrarian analysis will be successful this time around? We don't, of course. But it's worth stressing that contrarian analysis is right a lot more often than it is wrong, especially when at extremes, like we are now. Gold's seasonal tendencies are yet more evidence pointing in the same direction as contrarian analysis: Gold is due for a very strong rally perhaps setting up the EXPLOSION to $2500 that I have been calling for. I have not let you down in 10 years including 2006 and 2008. In bull riding, you can only hang on with one hand, but when riding the Golden Bull if you are going to win you must Hang On with both hands. The odds are high that the HUI Mining Stocks Index, Gold, and Silver are about to rally sharply. My upside targets for the HUI are 580+/- and for Gold around $2,550+/-, reaching those levels by late January. To March 2012. Meanwhile, stocks continue in their downtrend, which is stair stepping lower, the slow rounded top to Wave 3 down will accelerate into a crash in 2012. All of my long term readers were not surprised by the shenanigans of the last few weeks. There are rarely any major surprises once you learn how to analyze political speech with an open mind and without pre-conceived ideological positions. My most frequent mistakes are usually ones of timing. I seem to continually underestimate the stupidity and ignorance of our media, Keynesian economists and politicians who don't seem to know how to tell the truth. In most cases, "The Obvious Is Obviously Wrong" is the one thought that has kept me and will keep you on the right side; that and COMMON SENSE. We are into the most trying times in our nation's history. We can either succumb to our Government's folly and go down with the ship or personally prosper. As always, the choice is yours. EXPIRING MEMBERS: Existing and expiring subscribers can extend their subscription for one year for only $199 or $349 for 2 years. A new Gold and Silver Timely Buy List will be sent to you tomorrow. NEW SUBSCRIBERS: Give yourself the investing advantage by getting a five month TRIAL Subscription for only $99. A one year subscription is only $249 and a two year subscription is only $349. SPECIAL: Month to MONTH is also available at $30/mth. Please call (561) 840-9767 to subscribe by credit card or mail a check for the required amount to: Don't forget to include your email address as well as your phone number. Aubie Baltin has spent his career identifying major trends in the markets and helping others to profit from them. He uncovers changes to the major trends in his newsletter, “UNCOMMON COMMON SENSE”, then presents specific, actionable recommendations to help his readers profit before they become obvious to everyone else. Just The Facts And Nothing But…But What Are The Facts? Did someone mumble "Goldman Sachs"? Run in the other direction if anyone is using their information, unless you're a crook. In that case, do exactly the opposite from what Goldman is suggesting, intimating, guessing or "vigorously recommending" and you'll either be prosecuted (doubtful given the actions of the current "justice" department and SEC) or winging your way to that island where all the previous Goldman chiefs have homes and private armies. As an Albertan I must make you aware that PetroChina is on a buying spree in the Canadian oilsands. The real hidden agenda behind the Gateway pipeline to the west coast. To get their own oil to China.